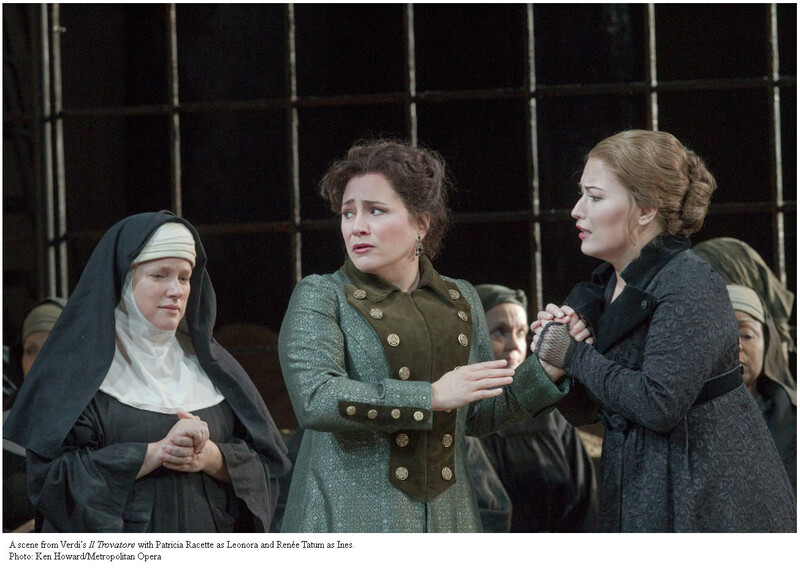 The Met’s taut, spooky new Ballo in maschera is the best new production this house has seen in some time. David Alden has finally brought his trademark surreal, minimalist film noir aesthetic to New York. Welcome to the early 1990’s, Met– the age when we all were scandalized by David Alden and thought he was crazy (not including me, because I was in elementary school and not going to the opera yet,* but you get the idea). But a production like this is always welcome, however belated, and compared to most of what we see at the Met it seems very fresh and modern. There’s nothing particularly shocking or radical about it; it’s certainly watered down from his European work, but it’s good drama and it would be a shame if the plentiful time-delay boos present at the premiere (I suspect due to the production’s deficit of horses and bayonets) detracted from its very real merits. The singing isn’t uniformly fabulous but it’s probably one of the better casts that can be assembled for this opera, and they are trying very hard. Verdi, Un ballo in maschera. Metropolitan Opera, 11/8/2012. New production premiere directed by David Alden, sets by Paul Steinberg, costumes by Brigitte Reiffenstuehl, lights by Adam Silverman, choreography by Maxine Braham. Conducted by Fabio Luisi with Marcelo Àlvarez (Gustavo), Dmitri Hvorostovsky (Count Ankarströrm/Renato), Sondra Radvanovsky (Amelia), Kathleen Kim (Oscar), Dolora Zajick (Ulrica). 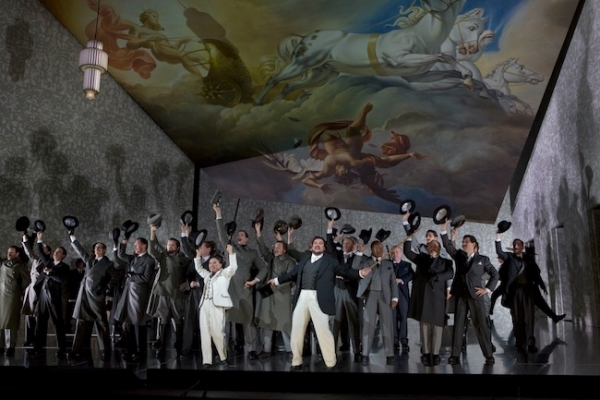 I can’t describe this opera better than Alden did himself in a recent interview: “the bizarre combination of serious political material, high Italian melodrama based around the hackneyed stuff of marital infidelity, and an almost operetta-like lightness of being, is experimental and dislocated and sets this apart from his [Verdi’s] other masterpieces.” Ballo is an opera much beloved by the scholarly set (and also Luigi Dallapiccola), who celebrate its radical mix of styles and apparently impressive motivic integration. 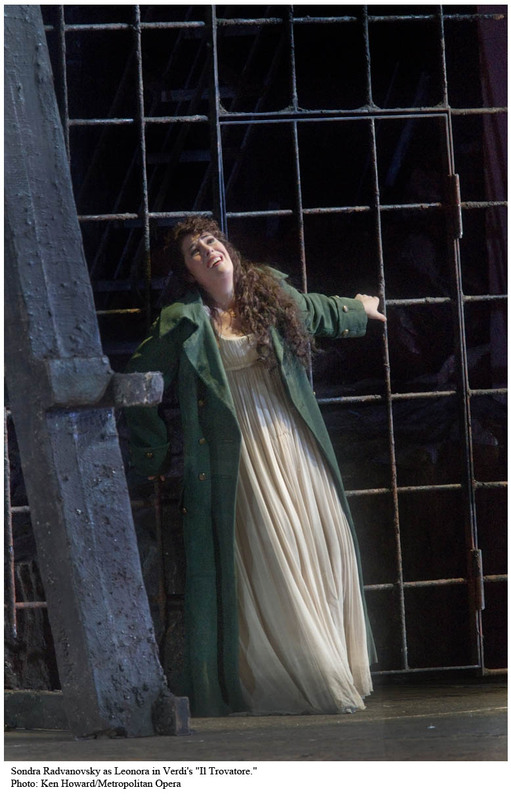 I’ve always had an “mmmkay” reaction to this because Ballo has never convinced me onstage–the mixture of comic and melodramatic styles seems like a bad idea and it’s never had any emotional resonance, possibly because its characters don’t get much exposition. 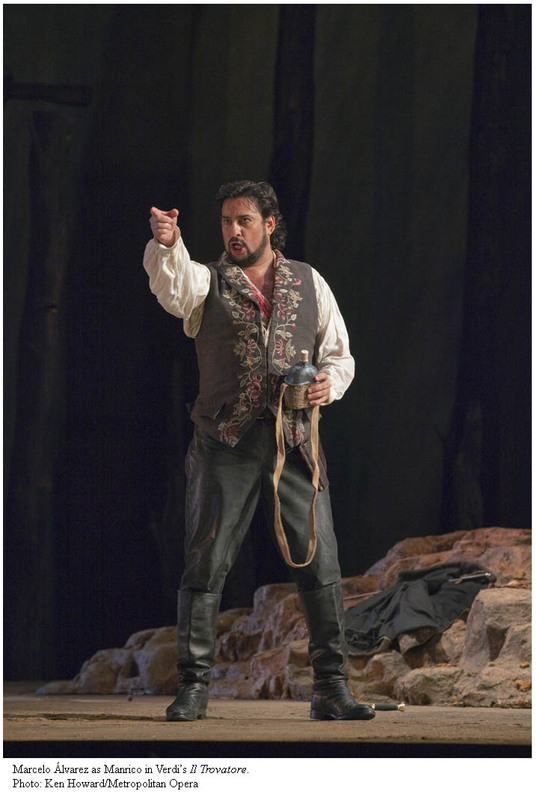 The music is frequently brilliant, but Amelia is a hysteric, King Gustavo a well-meaning doofus, Renato a bore, and smug coloratura soprano page Oscar one of the most annoying characters in all of opera. 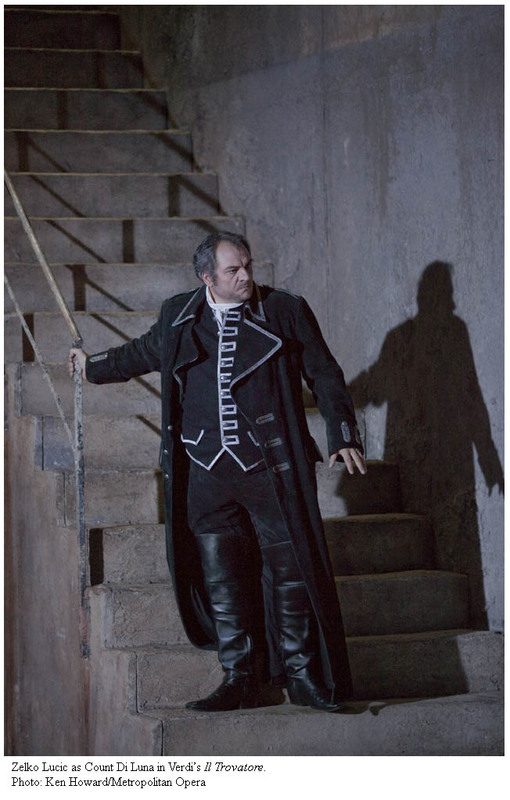 It has not been an opera to attract many Regie types, either, with Calixto Bieito’s notorious toilet production (which I haven’t seen) being a notable exception. 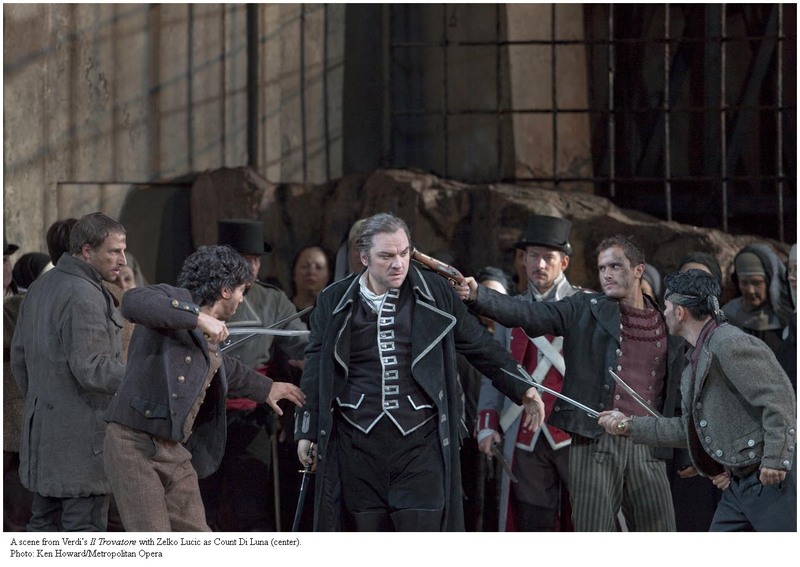 At the Met, Alden’s replaces a traditional, heavy production by Piero Faggioni whose most memorable moment was, when I last saw it, Dmitri Hvorostovsky getting tangled up in his own cape. Alden’s production does an impressive job with the first issue, coherence, but I’m afraid still nothing on the emotional front. Maybe it’s just that sort of opera. The “it’s all a dream!” trope might be, er, tired but for an opera this jumbled it’s a smart move and Alden deals with the changing tone with aplomb. We open with King Gustavo, dressed in a vaguely 1930’s/40’s suit, dozes off in a chair. An enormous Baroque painting of Icarus falling from the sky hovers over the stage, and Oscar enters flapping a pair of white feathered wings. This is kind of ingenious, because he evokes so many things–the painting above, Cupid (remember that Alden has directed a metric ton of Baroque opera in Europe), and the death figures who will finally appear in the finale. The walls are covered in hypnotic wallpaper (Alden and set director Paul Steinberg are wallpaper connoisseurs second only to Richard Jones), the stage steeply raked. The time and place are ambiguous, and never become any clearer. (This seemed to bother lots of people but I’m OK with it?) Gustavo and some other characters will hang out in this chair periodically–also genius because Alden has given any tenor his dream: a chance to sit down, take a break, and have a drink of water while onstage. The dreary setting constantly threatens to break, with the music, into exuberant comedy. Office drones sit at stainless steel desks but Oscar incites them to dance; a worried group of citizens visits crazy old lady Ulrica only to have some fun-loving sailors bring the thing to life. (Ulrica later pulls a memento mori skull from her purse to show Amelia.) Sometimes it doesn’t really make sense, but Alden can also keep the action straightforward and tight when need be. Renato and Gustavo’s relationship is clearly drawn early on–Renato is worried that his friend might be a little dim– and Renato’s dismissal of Ulrica’s prophecy has a clear undercurrent of denial. Purists will probably be offended at the lack of any gallows in Act 2, but the Personenregie is engrossing and the entrance of the conspirators from various trapdoors and upstage genuinely creepy. Act 3 begins in a claustrophobically tiny white room, featuring a physically intense confrontation between Renato and Amelia–the photo of Gustavo on the wall might seem kind of cheesy, but it makes the thing work. The ball features, on Met standards, remarkably OK dancing, and the ending suggests that everyone is still trapped. While it still didn’t quite convince me that Ballo is a masterwork (I know, I know, but I don’t feel it), it’s a compelling ride with the appeal of one of those crazy old B-grade noirs where all sorts of random stuff happens and none of the characters are terribly complex but it still keeps us involved. (Have you ever seen Detour? It’s bananas. Something like that.) I’m not sure if the Icarus stuff really adds the symbolic heft that is intended–OK, so Gustavo is a king who is taking increasingly treacherous risks, but so what?–but it doesn’t hurt and adds a note of fantasy to the disjointed nature of the setting. Alden gets impressive performances from his cast, most of whom are not quite known for their nuanced and natural acting abilities but convincingly make a real show here. 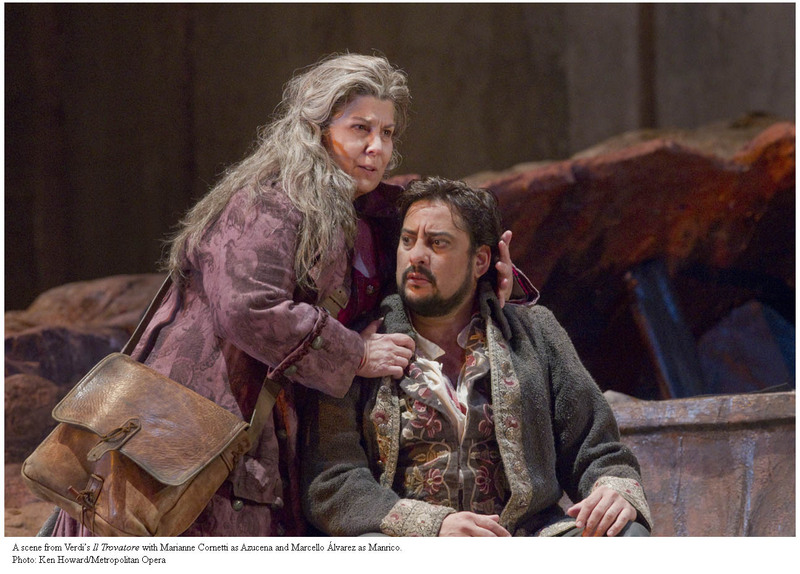 Marcelo Alvarez worked hard all evening in the long and difficult role of Gustavo, concentration written on his face. He managed to act (and dance!) pretty well, only occasionally slipping into the cliched gestures that usually constitute his entire performance, but the effort expended was a little too obvious. Similarly, his lyric tenor was pushed to its limits, producing an often-pleasant bright sound at the top but unstable and unsure of pitch in the lower reaches. He has a short musical attention span, tending to sing in words and phrases rather than paragraphs and lacking a long legato line. This was not a problem of Dmitri Hvorostovsky, but he was also pushing his voice and frequently sounded blustery. His voice has an absolutely glorious, velvety sweet spot around middle C, but the rest of the range sounds strained. The final section of “Eri tu” was his strongest singing of the evening–one suspected he had been saving his voice–and showcased his excellent phrasing. Acting-wise he was suitably intimidating and more nuanced than his usual cape-twirling, and also managed to completely outclass his tenorial colleague in looking good wearing a fedora. On the ladies’ side, Sondra Radvanovsky sang a knockout “Morrò, ma prima in grazia,” which sits in her English horn-like lower range and built beautifully over the course of the aria. I wish the rest of her singing had been as musical, but like Alvarez she often sounded somewhat raw and blunt. Her distinctive vibrato makes her tone instantly recognizable, and her intonation only occasionally sagged flat. Amelia is a hard character because we never know who she is, and Radvanovsky didn’t really solve this problem, but she did seem earnest. Kathleen Kim sounded sweet and bright as Oscar and darted around as demanded. I find this character insufferable but she almost made Oscar bearable, not leaning excessively into the tra la las. Dolora Zajick ,Queen of Chest Voice, made a mighty noise as Ulrica and didn’t really act too much. I do want to carry around a skull in my purse too, though. Fabio Luisi conducted like someone who doesn’t mind being left to the end of the review. I am always wishing for Pappano in this repertory but Luisi was perfectly able, keeping things efficiently moving if not always nail-biting. I wished for juicier melodrama and more contrast but it was clean and competent and the orchestra sounded really excellent. It might not be a reinvention, and if you’ve seen any of Alden’s work before you basically know what to expect from this one, but it’s a solid production that makes sense of the piece, and I hope the Met audiences give it a fair chance. *I made my first acquaintance with David Alden when visiting Munich at the tail end of the Peter Jonas era at the Bay Staats. Baroque mayhem!